Yang and Sara both won a free HangTimer! Did you know you can read Must have GIZMOS in your inbox? Members recieve a free newsletter in thier inbox every morning showing all of the post of the previsious days reviews and great deals. To sign up for our free email go here or you can enter on the right hand side of the website. Give-A-Way: Win a HangTimer from Must Have Gizmos! The Hangtimer is a very cool sports watch that can time your hang time from hucking off a cliff, bombing down a bike trail, extreme base jumping to jumping on a trampoline. Now you can prove to your friends that you are indeed the badass you say you are. Check out my HangTimer review for more information on this cool Sports Watch. Must Have Gizmos and HangTimer want hear about the craziest, funniest, wackiest way you plan on using your HangTimer. Respond to this post, and the person with the best story will receive a free HangTimer valued at $99. Update, I'm happy to announce that HangTimer has decided that we will have two winners instead of one. The contest starts today and will end in 10 days, on Friday, August 3, 2007 at midnight. The winner will be announced no later than noon on Tuesday August 7, 2007. Get your FREE iPhone today! Open to contestants until midnight Tuesday October 17, 2006. To enter the gorillapod (read review) give-a-way, just sign-up for our free newsletter to receive our MusthaveGIZMOS.com website straight to your email inbox. Seriously, that’s all you have to do, then we will pick the winner at random, assuming the contestant follows all of our rules: You may only enter this give-a-way once. That’s our only rule. So, what are you waiting for? I’m going ape for the gorillapod. That’s right ape! This ingenious little tripod which finally made its way back to me from one of our GIZMO testers and we all believe that this product is an incredible little tripod killer. The traditional tripod is going to be the next slide rule. The gorillapod firmly secures your smaller, lightweight digital camera to just about anything...anywhere and everywhere with a gorilla like grip. Unlike traditional tripods, which I will be selling mine in our next garage sale, the gorillapod doesn't require a flat surface for you to take the perfect shot. Like a gorilla this tripod replacement can grip or be wrapped around a sign, fence, tree, pole, beer bottle, chairs…hopefully you got the picture. This product cannot get any easier to use, right out of the package – no instructions necessary. Each leg features nine rubberized ball-socket joints, each of which can rotate 360 degrees to help it grip onto anything. For easy setup, you can keep a slim clip screwed into your camera’s tripod adapter and then slide the clip into a slot at the top of the gorillaPod when you need to stabilize your shot. A lock ring prevents the camera from slipping out. It’s also amazingly light; coming in at just 1.5 ounces and it uses the traditional ¼-inch screw. For those of you looking for something that can hold a bigger Kong size camera or camcorder. Joby has the gorillaPod SLR. 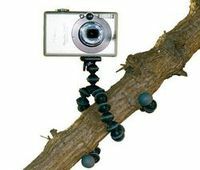 Obviously designed for digital SLRS, this version of the gorillaPod can also be used for small camcorders. It can hold up to 2.5 pounds and like his little brother it can wrap around just about anything. 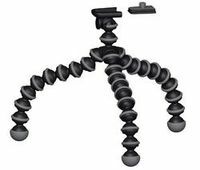 Now is the time to replace your traditional tripod with a gorillapod and if you select this link you can save $3 on any purchase by typing MHGIZMOS in the coupon code box. Or you could get lucky and win one see our give-a-way at the top of the page. The company that I work for had received so many application from perspective employees that we started doing phone interviews instead of face to face. On one of these interviews I call and spoke to a woman, after asking her several question. I came to one question and I asked her is she could elavorate and she stated no. I gave her my cell phone number and told her that if she had any quesitons about the interview later she could call me. Later on that day I recieved a message on my cell phone from the woman, the message stated the following "I lied to you I can elaborate, I was just to embarrased to tell you, plus I did not know that they asked these kind of question at job interviews. I have only done it twice and it was because my boyfriend told me that I would taste good, I usually spit it out, but I have elavorated twice." I could not believe what I had heard, I pass this message to everyone in the office and this became the joke of the building for about 2 years. By the way the original question was have you done fileing in the past? her answer was yes, I asked can you elavorate? and she paused and then said no. My dad has never used a computer until about a week ago, when I convinced him to check out going online so he can pick up golf news and scores. I decided to set up a yahoo account for him and I e-mailed him the username and password and he needs to login with. This was an actual phone message I had in my voice mail the next day: "Anthony, I'm trying to get to that yahoo thing and I can type in that username but I think there is something wrong with the computer because when I try to type in the password all I get is stars instead of any letters, so I'm not sure how to type in the password." I know you love stuff – buying it, having it, especially winning it – and I love giving stuff way. With the help of GotVoice we are giving away an iPod Shuffle to one creative winner and one runner up will receive three free months of GotVoice Premium service. Seriously, we are and all you have to do is tell us about the craziest, funniest, wackiest voicemail message you’ve ever received. That’s it – just tell me about it in the comment section of this post.